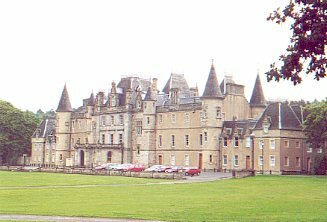 Set within beautiful parklands a mile (1.5 km) east of Falkirk town centre, Callendar House dates from the 14th C. It was home to the Livingstons of Callendar (who became the Earls of Linlithgow) for almost 400 years and then to Sir William Forbes (1743 - 1815) and his successors. Originally a fortified tower, it was visited by Mary, Queen of Scots (1542-87), whose guardian was the Alexander, 5th Lord Livingston (c.1500-53), as well as being seized by troops loyal to Oliver Cromwell (1599 - 1658). James Livingstone, 5th Earl of Linlithgow, lost his estates following his support for the Jacobite Rebellion of 1715, and the property passed to the York Buildings Company who leased it to the Earl's heiress, Lady Anne Callendar, who had married William Boyd, 4th Earl of Kilmarnock (1705-46). The couple were foolish enough to support the Jacobites in 1745, entertaining Prince Charles Edward Stuart (1720-88) at Callendar before the Battle of Falkirk. Boyd was executed, although Lady Anne and their son were allowed to remain at Callendar. The estate was bought for £100,000 at auction in 1783 by William Forbes, a London-based copper merchant, who had been born in Aberdeen. He restored and extended the house. In the 19th C., it was remodelled in the chateau style which is evident today. The remains of the original tower can still be seen in the unusual angle of the front wall of the west wing. Callendar House and its surrounding parkland were acquired from the Forbes family by Falkirk Town Council in 1963 through compulsory purchase to permit the building of high-rise flats. After years of uncertainty, the Falkirk Museums Service was established here in the late 1980s and extensive permanent displays include features on the story of the house together with the social and commercial history of Falkirk in the 18th and 19th centuries. The public can tour the principal rooms, together with the kitchen which is run as it was in Georgian times with cookery displays and period food available for tasting. The museums service has outstations at Kinneil Museum and Grangemouth Museum and Workshop. Callendar House also includes a History Research Centre, a local and family history archive for Falkirk and the surrounding area, located in the oak-panelled and barrel-vaulted former library in the house. It formed a filming location for the Sony Pictures time-travel fantasy television series Outlander (2016).